It is no secret that I like cream bicycle tires. If you are a fan as well, you will find this recent thread on bikeforums a real treat - loads of pictures of classic and vintage cream tired bicycles. And, since I am asked about this all the time, I have compiled below a directory of cream and white tires in various sizes that are available on the market. My criteria for these selections were reasonable availability and all-over colour (as opposed to white sidewall on a black tire). Unless noted otherwise, all tires listed are puncture-resistant. The selection is not huge, but there is something to be had in almost every wheel size. If you know of other cream or white tires I have omitted, please let me know and I will add them. Hey, I just went through this for my '88 Schwinn Premis road bike. Shod it with sweet white Vittoria Rubino Pro 700C x 23mm. A bit hard to track down, but doable with Google's help. I expect these tires are not as high quality as the Schwalbe tires, however. Michelin made several sizes a long time ago... I've two pair of 700x32 that have held up well. Noel - I thought the Vittoria Rubino has black walls. Is there an all-white version? Joseph E. - Thanks, I forgot about Electra. I have changed the list to include tires without explicitly stated puncture resistance, this being indicated by an asterisk. Interestingly, the Electra tires are not less expensive than Schwalbe. Joe - I have seen those and they are beautiful. Wish Michelin still made them! I think the closest thing they make now are the two tone Pro Race with some white in them. Okay, found two more from Electra. I don't know if I would risk my money on the Electra tires. 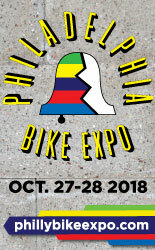 Note that Electra puts Schwalbe Fat Franks on their Townie 8i Balloon bike, rather than using their own 26 x 2.35 tire. I'm sure Schwalbe is a safe bet. But it's nice to have the 26 x 2.125 size as on option, from Electra. I wish someone would make a 26 x 2.0 or 26 x 1.5 (559 mm) tire in cream, which would fit on many modern city bikes. 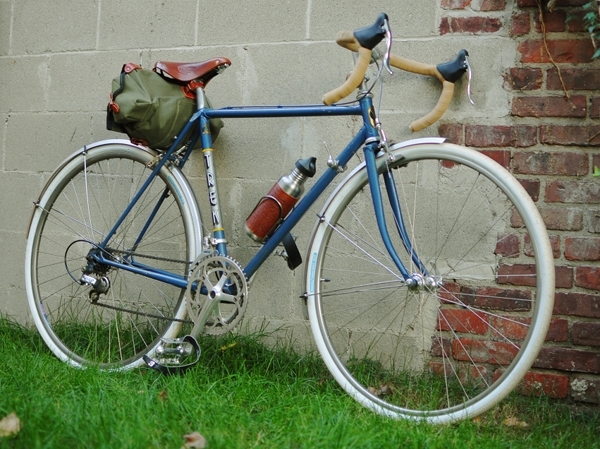 The 26 x 2.35 or even 2.15 tires are too wide for most forks and fenders, and likely would not fit on my Breezer Uptown. Schwalbe should either make a smaller Fat Frank (say, 2.0 inch / 50 mm), or offer the whole Big Apple line in cream, or make a 26 x 1.5 Delta Cruiser in cream. Fat Franks are also available in 50 mm x 622 mm size (28" x 2", or 700C, or 29er). Anonymous - after several months the tires look the same as after the first ride. They stop being 100% clean immediately, but then stay at the same level. Joseph E - Thanks once again, I will add these tomorrow. Had no idea that Electra makes so many cream tires. Oh, and I think those 700C Schwalbe Fat Frank are new this year? My wife's toer populair is fitted with them (they're not labelled "roadster" though, just "Classic"). They have a, well, "classic" retro looking tread and, so far, they've been comfy and puncture resistant. I literally cannot imagine my dove gray Retrovelo with anything but cream tires. And I agree that they reach a certain point of dirty on the tread immediately and then don't change much. I've found the sides stay pretty much cream, too, impressive as I live in a truly foul and industrial part of NYC and use the bike on most days. As far as 27" tires go the only ones I know of are complete junk but if somebody wants them you can always find them on ebay. They are CST C740 they come in many colors. I owe my love of cream colored tires to you. I put them on one of my Raleigh Superbes after reading your blog and recently picked up some Fat Franks that I will find a use for sometime in the future. There are some Trek bicycles in the 2011 lineup that are coming through with creme colored tires so I would expect to see some available with the Bontrager label on them very soon. When I was mountain biking about fifteen years ago, Panaracer made their Dart and Smoke (for the front and rear, respectively) with a light tan sidewall and a cream-colored tread. They remained my favorite mountain bike tire for several years: They gripped well and, well, they looked really cool. I'm not sure of whether they're still being made, as I don't follow mountain bike developments. I've seen the Michelin white tires on eBay. I was tempted to buy some, but I'm leery of buying older tires unless I can see them in person and inflate them. I once bought some tubular (sew-up) tires from a shop that was going out of business. I think they were improperly stored for too long, and they started to break apart like land along the San Andreas fault when I inflated them. But those Michelins sure look nice--and it's hard to beat the quality of Michelins ,\made up to a couple of years ago. For more than a decade, I rode nothing but Michelins on my road and cyclo-cross bikes. However, I hear they've stopped making their tires in France and have moved production to Indonesia or some other third-world country. They still may be excellent tires, but Michelin is one of those names that was always synonymous with "France" for me, so such a move, if it were so, would be a disappointment for me. The real reason I stopped riding Michelin, though, is that I ride mainly 700X28 tires now, and the ones Michelin offers in that size weigh about twice as much as the next size down, 700X25. I've seen the Vittorias listed on a few sites, including Bike Tires Direct. From what I've seen and read, they're a good tire and good value. PS: I love my cream Schwalbe Delta Cruisers! All your 26" are not equal. The Schwalbe Delta Cruiser is a 650A (590mm BSD) and, AFAIK, available only in the UK. Corresponding rims aren't easy to find. They are EA3 rims and showed up mostly on British 3-speeds. The remainder fit mountain bike wheels with a BSD of 559mm. Oh, 650Bs are also part of the 26" family. Odd family, that. Thanks, I have added all the suggestions! Joseph E. - I don't think 29er tires will fit on 28" or 700C wheels; is this incorrect? I would love to sport Fat Franks on my 28" wheeled bikes. That would be pure awesomeness. The rims are larger than 622mm, though, so I can't use 700C tyres. I wonder if they really do make 28" Fat Franks... that would be one huge & smooth pothole-swalling wheel. The mudguards would need to be altered,unfortunately. Both my Pashley and the DL-1 will not clear Fat Franks at different fender points. Not sure how hard or easy the task would be. Hey can any of you guys that use these tires tell any difference in how they grip - particularly on wet pavement? I gave up on finding cream tires for my 27" pseudo pathracer, thanks for the info on the Cheng Shins. Julian - Thanks, I added the Kenda Kwests. Spindizzy - I hope they work out; note all the "cheapo" comments about them on the web. John I - I think the only way to tell is to search for reviews of the tires that interest you. Usually people will post feedback on forums and blogs. Anybody know of 20" - 406 cream tires? I'd love to get a set on one of my Raleigh Twenty folders... I have a set of Schwalbe Delta cruisers on my DL-1 Tourist and my Raleigh Competition GS. Love the way they soak up road shock. 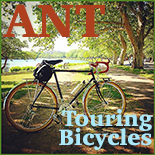 I ordered a ANT truss, and the cream tires are one of the biggest reasons. Excellent and very useful post, Velouria :-) Cream tyres look great on classic bikes. Thanks so much, and PLEASE keep up the blogging! Honestly, it is the highlight of my day to come home and read the newest entry. Anon 7:30 - Regarding the bicycle pictures I posted on bikeforums, I no longer own all of them (I've sold the Pashley). But speaking more generally, I do not associate bicycle ownership with any particular system of values. Some people own just one bicycle, others own a collection of dozens. Being an owner of 6 - 4 of which are vintage - I fall somewhere in the middle... and believe it or not, most other classic and vintage bicycle lovers I know own more bicycles than I do. OMG, I saw Marianne today on Beacon St. near Coolidge Corner!! size confusion: as someone noted above, the 26" delta cruisers are one of several "26x1-3/8" sizes; they're also at times referred to as "650a". Whatever; they're come up with ISO measurements for a reason. These critters are probably best referred to by bead-seat diameter. In this case, it's a 590. 650b is 584. 650c is 571. Confusing, indeed. Back to the confusion over creme tires. 28" can refer to both ISO 635 rims, or fairly fat tires on ISO 622 (aka 700c) rims. Depends on where you live. If you're both running 28" tires *and* referring to them as such in north america, you'd better know which you have. After all, running 28"s in the states is best left to erudite bike snobs; no one feels bad for snobs who order the wrong tire size. The new fat franks are ISO 622, more commonly referred to as 29"x2.0". Fat franks in this size have been available for awhile; the creme colour is new to the big version. Herzog - Yes, that is where she lives now! I am happy to know that the new owner is riding her. Basically, back in yesteryear, when there were piles of different tire sizes vying for dominance, the 28" tires in "western europe" were 635s (including the UK, netherlands, france) whilst scandinavians and even many germans used the 28" designation to describe dookie 700c-compat rubber. Nowadays, who knows? Priorities have changed, and the 635ISO is all but extinct. Describing a city bike as being "classic" is almost as slippery as calling a cycle enthusiast "minimalist", but yes, the 590mm rims were the 26x1-3/8" used on vintage brit bikes and similar. The rest of the tires on your 26" list are the 559mm, "modern" 26" tires. The confusion is totally understandable. I was working in the cafe a few weeks back when a regular, who is from the UK, came in with a really cool german-made town bike he'd been lucky enough to trashpick. I forget the brand, but the frame was made in germany, and it had a sachs 3speed and a b&m bottle generator. It also had 28" tires, which he saw as a drawback, b/c as a limey, he was thinking the 28" was 635 ISO, which means replacing the rubber would be tiresome. (HAHA. puns.) I took one look at it, from like 20 yards, and guessed that it was probably a 622 ISO rim. 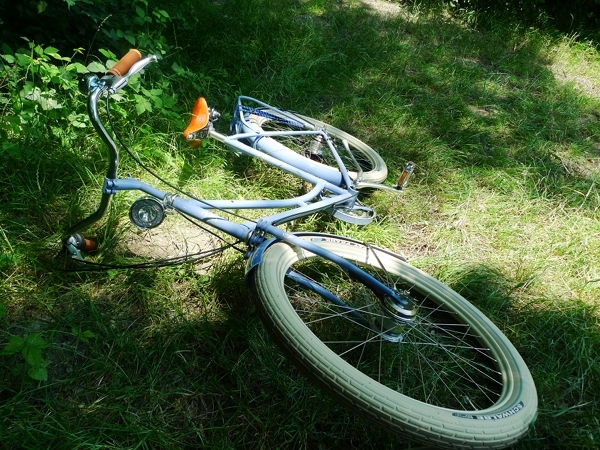 Not because my eyesight is that good, but because this was a german-made bike, of a early 1990s vintage. We checked the fine print on the tire, and sure enough, it was something like 622x45mm. Easily replaced, easily swapped for fatter or thinner stuff. While I'm tempted to make snotty remarks about the existence of your "creme tire" list, the truth is, I'm glad it's here. I enjoy your blog tremendous. It keeps my eyes rolling, sometimes, but it also keeps my gears turning (figuratively), and it gives the reader a unique perspective from someone who is essentially a rookie with bikes, but who writes well and whose taste has given her some useful information that is worthwhile for ppl who've been riding longer. I think my only real suggestion would be to revise your list above, breaking it up by BSD rather than the confusing nominal sizes, which has led to some mixin' and matchin'. unfortunately, I've been unable to find cream or whitewall tires in the 597 ISO for the Lenton Tourist I'm picking up on Saturday...although I have been able to find (low end) gumwall Kendas that would be an aesthetic match. I think I may swap out the wheelset for a set of 700c wheels with an AW hub in back and a Novatech dynohub up front, just for daily riding, while keeping the original 26X1-1/4 wheels in storage. any hints for cleaning white tires? Mine got filthy with street dirt here when I rode in the rain and I haven't been able to get them even back to something less than dark grey. my brother looked at my bike and said "well, that's a convincing argument against white tires in Tokyo" just from the looks of them. sigh. Veloria, you wrote: "I don't think 29er tires will fit on 28" or 700C wheels; is this incorrect?" Rob already mentioned that 700C wheels are better referred to as 622 mm ISO. It turns out that "29er" mountain bike tires are also 622 mm, and interchangeable with 700C wheels, at least if the tire width fits in the bike. The Fat Franks are 60 mm wide for 622 mm ISO wheels. So they should work for 29er mountain bikes, city bikes with 29" or 700C wheels (and wide fork and frame clearance for fat tires). Apparently they call this size 28" x 2.0" in the UK, but I know that is confusing, since many 28" tires are actually ISO 635 mm. So the current 622 mm Fat Franks are no help for your husband. I doubt classic roadsters have enough space in the fork or between the seatstays for 60 mm wide tires, at any rate. 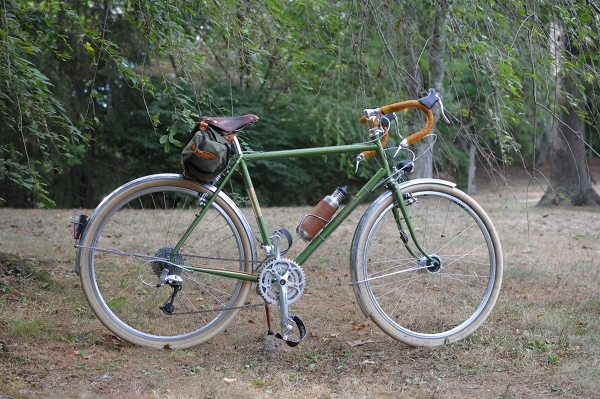 We really need some wider 622 mm cream tires (say 40 mm and 50 mm), 597 mm by 37 mm tires (to fit Schwinn bikes and some other "26 x 1 3/8 wheels), and thinner 559 mm cream tires (37 or 45 mm). dokinchan - I find that automotive tire cleaner works fantastically...bleach also works well on real white, but I wouldn't try it on cream. rob - Thank you for the entertaining narrative about the English gentleman and his 28" wheels : ) As for the other stuff... the way I figure, it is inevitable that the content of my blog evokes some eye rolling; I do not pretend to be an expert. But what's the point of worrying about it? Anybody who writes anything will at some point write something stupid, or not entirely accurate, or naive. I am willing to take the chance, and I appreciate that knowledgeable old-timers such as yourself tolerate it and still find something of interest here. Regarding tire sizing... I will stick with the system I have, for the simple reason that I think *most* of my readers will find the present system more useful than if I were to state the ISO measurements - which would confuse the heck out of people. If I muster up the energy, perhaps I will look up and add all the ISO measurements in parentheses.. I understand keeping the list as-is; really, the only ISO 590 tire listed is the 26x1-3/8 delta cruiser, which is fitting b/c the 590 ISO/ 650A/ 26x1-3/8" tire size is well on its way towards total obsolescence. But, seriously, what's up with the GEAX tires? They get no love on Lovely Bicycle? Sorry, I forgot to add the Geax; it's there now. As for aesthetics - hey, someone's got to do it. Don't fool yourself into thinking they are not important. I never advocate form over function, but I do think that they can go hand in hand. It's the one at the bottom of the page; select color to see "Cream / 700Cx32 / 600 g"
According to the details, it has "Flak Jacket" basic puncture protection. Specialized has cream Hemisphere Sport Tires in 26x1.95 (559x47; just what I was looking for!) and 700Cx38 (622x38). Unfortunately, they have knobby, "all-terrain" tread, which ruins the look, and also is less practical for use on pavement. But they are also available in white and gray, and have "Flak Jacket" puncture protection. It's nice to see so many cream tire options from Specialized. Too bad the tread patterns are rougher than needed for road tires. During the 90ties came some mountain bikes with cream colored tires. Those bikes or tires are in good condition really rare, but from time to time available on Ebay. Nevertheless, bikes with white tires rules! the 26x2.125" size ended up being a little too fat for my rear triangle. After much searching, I located these no-name beauties (only three left!) that are either 26x1.25 or 26x1.75... I guess I'll find out when they get here. I also bumped into some interesting 26" options on some Japanese sites, but none allowed export from Japan without first going through an address forwarding service. no thanks. The tires are sold as 'GO-Garneau' brand and are offered in the whole gamut of 26x decimal sizes. Here are a few. In Mexico City one can find the 'Deli Tire' a 28 x 1-1/2 inch nylon brown gem. I have not found it in the US or anywhere on the internet. I have had a pair on an old Raleigh, that I ride more or less 20 miles a week, for two years and they still have plenty of tread with no flats! what is wrong with aesthetics? Brown and Cream are much closer to the nature of nylon and rubber than black and, I would say, aesthetics is the nature of beauty and the beauty of nature. One more manufacturer who makes cream ISO 559 x 60 is Felt, type is Quick Brick. One important notice for Schwalbe Delta cruisers is that you can get them without reflectors. Then they suits better for vintage bikes. Cream ISO 622 x 38 tubes is made by Dugast. Just curious...what is the third bike pictured in the blog post above? 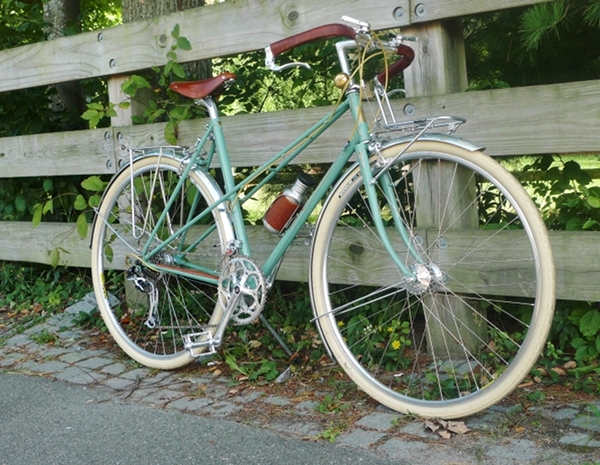 The celeste (or light green) mixte? 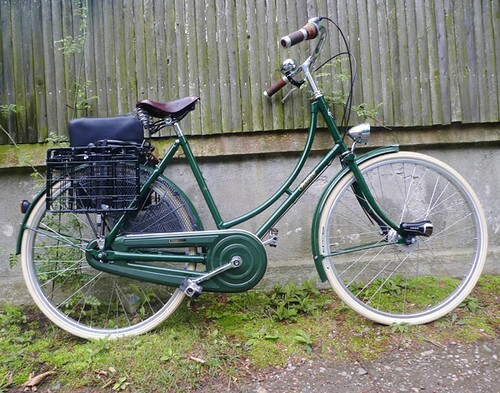 It is beautiful and exactly the kind of bike I have been looking for (a mixte and all)! Thought maybe if someone would know the make and model I can be on the lookout for one! Hil - It's my bike! See here. Hey, I'm struggling to find some cream tyres to spruce up my old post office bike. I was milliseconds away from ordering some 26" Schwalbe Delta Cruisers, when I saw something about ETRT numbers, which I have been blissfully unaware of during my 32 years on this planet. Turns out these tyres would be no good to me (Bah! Humbug! ), as what I need are 650B tyres. Any ideas where I might be able to get some cream tyres in my size, anywhere? 27" cream tires info PLEAAAAASE!!! 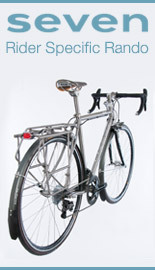 That is a Rivendell Sam Hillborne, frame circa 2009 (there have been several slightly different versions). Word has it that the Delta Cruisers are discontinued! They are out of stock pretty much everywhere in North America, though are still available on Ebay from the UK if you're looking. I do hope that whatever they are being replaced with come in cream and in the essential 26 x 1 3/8 size! They have Ralson brand (Made in India, I believe) and you can order them in Creme or black, as well as grey and RED! I think there are some decidedly Lovely applications for red tires. You can also get rod brake set ups (Raleigh or Phillips style), a spoon brake set-up (wouldn't that look spectacular on a fixed gear? ), and multitude of dress guard skirting options. It's best to keep one's eye on the Euro to find a favorable exchange rate, but I've ordered several things from them, and so far have been quite pleased. 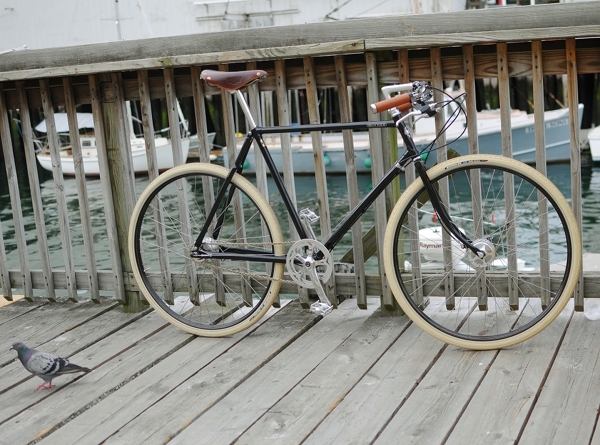 I ordered the creme tires for my commuter bike in progress (a 1920s American motorbike with Nexus 8spd coaster, and a Sturmey Archer Dynamo/drum) and they look absolutely fantastic mated to the black rims w/ gold pinstriping. Ei, could I get cream tires from this size? I would love to have cream tires from my bicycle. I wish I could find cream tires for a Raleigh Twenty.... They just never seem to go that small. Erin B - Kenda Kwests come in cream 20". Everyone - Just found another 27x1 1/4" white tire! From Origin8, the Elimin-8er 2 comes sized 27x1 1/4" in white, red, blue and grey. Kevlar, etc. 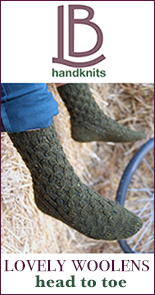 I just ordered a pair from Amazon - if they blow up in my face I'll report back accordingly. Be carefull. Kwests are 20" (451mm) not 20"(406mm). Schwalbe Road Cruisers are available in a 26 x 1.75 - the biggest I can squeeze under my fenders. I bought them direct from the Schwalbe North America site. Hi, Some one knows where to find a 22 1 3/8" white or cream tires? Great post, love creme colored tires. Anyone know whether I can use a 28" x 1.5" schwalbe delta cruiser on a schwinn coffee with 700c x 38mm? I especially liked Schwalbe because of their know flat protection. Thanks! What about 28" 1 1/2 red color? any advice? does anyone know where to find cream or brown tires in size 700x38c? or any other neutral color? thx! I want 32s in cream with maximum puncture resistance. The animal doesn't seem to exist! I can get hold of some ralson Tyres, not a chance! Does anybody know how to get some?